Summer's here along with the heat, humidity and the lack of winds. I'm still hoping we can mix some flying with some workshops this Summer. I'm still taking ideas, including some proposed dates for workshops. Current suggestions for projects are miniature kites (probably paper-fold unless someone gets daring enough to try making little sticks or other ideas for spars and a set of tetra cells based on the multicell tetra at AKA Nationals. If you have any other ideas, or would like to "host" a workshop, e-mail Marty or Jim with your ideas. For more events in the Southeast or others that may not be listed here, click here to visit the AKA Region 4 web site. 8th - This was a good windy day at Frank Liske Park. Click here to see a few pictures. 10th - Georgia International Sport Kite Championship. We had a great time for the third year at Tybee. Click here to see the pictures. 23rd & 24th - Anybody for a Thanksgiving weekend fly? If you want to fly, come to Mint Hill Park (click here for map) since I think Frank Liske will be closed for the weekend. But let us know via e-mail so you don't have to fly alone. 6th - Frank Liske Parke - The weather folks are say a 50% chance of rain in the morning but partly cloudy in the afternoon. They're also promising WIND! If it's raining in the morning, look for us in the barn. 27 - 28 - Carolina Kite Fest at Atlantic Beach - Click here to get more info. There will be a few WACKOS there. We're doing something different this month due to the Labor Day weekend and the Kite Gypsies thing at Myrtle beach. WE ARE GOING TO FLY ON THE 2ND AND 4TH SATUDAY AT FRANK LISKE PARK instead of the first and third Saturday. Since everyone will probably be busy Labor Day weekend and most everyone wants to go to Myrtle Beach with the Kite Gypsies, You won't have to feel guilty about staying home and flying. So, contact Ray Williams and get the scoop on the Kite Gypsies. Let's see if we can make the WACKOS and the Kite Gypsies at Myrtle Beach. 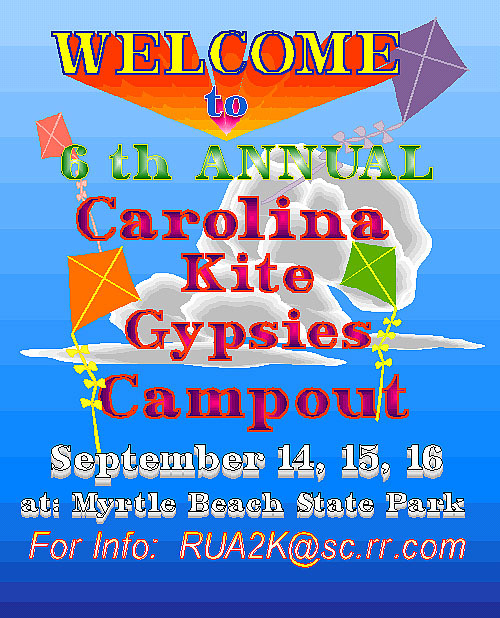 14 - 16th - Carolina Kite Gypsies at Myrtle Beach - click here to see the poster. Contact Ray Williams - RUA2K@sc.rr.com - for details. 18th - Aside from a few rain showers, the flying wasn't too bad today. The morning started hot and sticky but cooled off after a couple minor showers. Thanks to Jeff, we had a dry place to sit. A couple fighters flew, some light wind stunters and a large delta managed to hold up the "Little Red" octopus for a time. Later in the afternoon, there was enough wind for a rok battle. And if you didn't come out today, you missed Stuart flying a single line kite. As he played with a tumbling cube he could be heard to say, "I can't believe I'm flying a single line kite!". 7th - Y'all missed a great day for July. Temps were lower due to the cloud cover, but the winds kept stuff in the air. 5th - This is our regular club fly and the Gulf Coast Kite Fest, Long Beach, MS. Read more about the Long Beach Kite Fest at the AKA Region 4 page. And I finally got some pictures on the site! Click here to see the first set. April 2001 is National Kite Month! 7th - WACKOS 3rd Annual National Kite Month Fun Fly at Frank Liske Park. 21st. - Here's another chance to get out. The weather looks great and hopefully there will be some wind. Also the 28th - The Red Bud Festival in Saxapahaw. Here are some directions but they're spotty. I've been told you can look for signs once you get to Mebane. Take I 85 North to the Mebane Oaks exit. South to Saxapahaw. Go 8 miles on Mebane Oaks Road to Highway 54. Go straight 3 and 1/2 miles to Beth Church Road. Turn into drive. 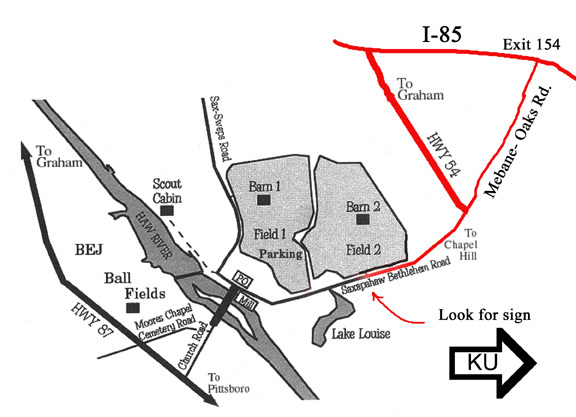 Entrance to the field is across from 1864 Mulberry Lane. Click here to see a local map of the area. Spartanburg Hwy (also known as 176) to Blue Ridge Road (approximately 1 mile) turn right or west on Blue Ridge Road go 3/4 mile field is on your left! A nice ride from Charlotte to get to I-26 is to take I-85 to the exit for US 74 around Kings Mtn, through Shelby and on to I-26. It gets slow around Shelby but it's mostly interstate-like roads. I hope the wildflower plantings along US 74 are in bloom, they were near spectacular last year. Freedom Park - Charlotte/Mecklenburg Parks and Rec is planning a Kids Kite Day at Freedom Park. You received an e-mail about this from Jim with more info. Check it out! Tybee Island - Gone With the Wind SKC. I don't know of anyone going, but let the others know if you're planning to go. 17th - This, the third Saturday in March, also happens to be St. Patrick's Day. Of course, it is well known that green kites don't fly, but maybe we could have a Mass Ascension of kites that are green, greenish, or at least have a touch of green in them? Or, there are a few kites in the world with celtic graphics, if you happen to own one of those, this would be the chance you've been waiting for. There's also the Harmony Kite Fly near Statesville. 24th - Again, two choices. Warm weather, Blue sky. Lots of kids. Nice field. Porta Potties. "On behalf of the Alamance County Recreation and Parks Department I would like to take this opportunity to thank the WACKOS for attending our 2nd Kite Day at Cedarock Park. We were very pleased with the attendance we had this year. Mike McMullen and Jim Martin were most gracious and went out of their way to help make our event a success. This is the second year the WACKOS have attended our event and we compliment you on your professional and fun-loving attitude. The Alamance County Recreation and Parks Department looks forward to working with the WACKOS in the future." Lake Park Kite Day, Lake Park, NC Lake Park Kite Day was a lot of fun. Blue skies and warm sun, swirling and highly variable winds that sometimes were marvelous. There were lots of families from the community and they were all flying something. There were some high flying deltas and diamonds, several biplane kites and kids, Moms & Dads running around all over the place. The red octopus made an appearance, as did 'Peanuts' the 7' elephant. Faye Raye was there but was very cranky all afternoon. We were warmly welcomed once again at Lake Park. 10th - Field Trip! Mike's Kite Museum was great! If you do get a chance to visit, it's really worth it. You haven't ever seen this much kite stuff in one place, ever. 17th - If you didn't make this one, and there were a lot of you, you missed a fine day: Sunny, good breezes and great fun. 6th - Those of you that didn't come out missed the BEST FLYING DAY THIS YEAR! So far, anyway. At one point we had 7 flyers and about 9 kites in the air. 13th - Treasure Island Kite Festival and Competition - (Notice how the competition is such a small part of the whole thing?) This was the best TISKC of the three that have been held! There weren't many WACKOS there (just me!) but I wanted to prove that kites do fly at Treasure Island during festivals. Click here to see some pictures. There are a bunch of pictures from WACKOS Year 2000. Click here to visit those pages.